China is in the process of re-inventing itself, especially in the creative arts and fashion industry. Chen Nan talks to one of the main motivators in the field. Hong Huang, also known as Huang Hung, is an author, television talk show host and magazine publisher. Her personal blog has attracted over 100 million hits while some 800,000 fans follow her micro blog. The chief executive of China Interactive Media Group has also starred in a movie and published three books. But most of all, she is a strong advocate of the Made in China brand. Now she is about to break new ground with the opening of a 540 square-meter shop in Sanlitun Village, Beijing. Brand New China (BNC) will gather about 150 young Chinese designers, showcasing their clothes, accessories and furniture. "BNC will show off China's up and coming designers to expatriates shoppers and excite local fashion followers," Hong says. 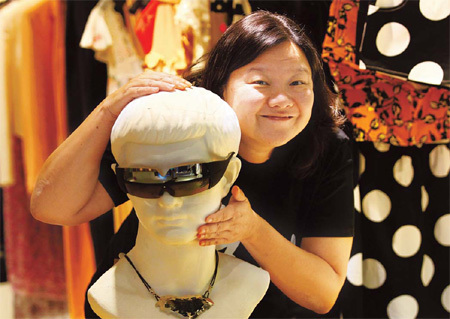 She has consistently spoken up for local designers and local brands and many talented young Chinese have been featured in her magazine iLook. The publication was founded in 1998 as a slick luxury goods periodical and now boasts a readership of nearly 60,000. "The magazine has focused on one or two local designers in every issue since it was launched. And as the designers grow in influence among consumers, we need to make sure they have more direct access to the public," she says. For the interview, the 50-year-old media entrepreneur was outfitted in a loose Chinese-style dress paired with shiny leggings and sandals. She has always managed to present a sharp perspective few others can claim, especially on the cross-cultural gap between East and West, often stirring up controversy with her straightforward comments. "I've always been intrigued by why a talented Chinese designer has never made it to the West, never broken through to international markets," says Hong. She herself has straddled cultures, having grown up in New York city. She was sent there at the age of 14 by her late mother, Zhang Hanzhi, a former Chinese diplomat who once served as Chairman Mao's English tutor. "You can't ignore these designers anymore. The economy is booming. I think Asian designers, especially Chinese ones, are ready to take their rightful places on the world stage. They have been widely exposed to the West and they have their own ideas on fashion," she says. 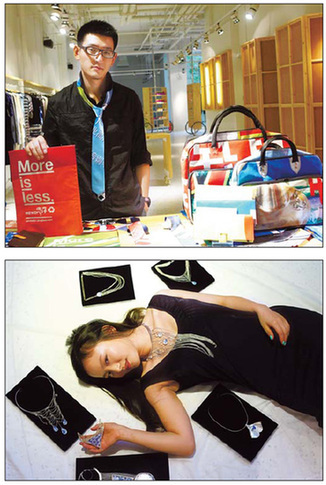 Among those Hong praises is Wei Ming hui, who speaks for eco-fashion and was talent-spotted by iLook years ago. He was inspired after seeing the vast amounts of street banners, light-box materials and advertising brochures that were being thrown away. Wei drove along the streets, picked them up and recycled them into his collection - Nei Cun, or Memory - in 2008. He made the discarded items into handbags, wallets, briefcases, document folders, notebooks, suits and ties. "All the products embodied the concept of recycling and re-designing for the sake of environmental protection," says the 30-year-old designer, a graphic design graduate. "These products are practical for daily life and the resulting patterns and colors are entirely accidental and unique." Wei says recycling in fashion is not new in Western countries and the trend has already caught on in China recently as people started to design products with second-hand denims. "The concept of 'more is less' is popular in the eco-fashion world. I want to build Memory into a brand that has lasting power and is accepted by domestic consumers," he adds. For another designer, inspiration came from a different age. In 2007, Huang Yichuan's first jewelry collection was based on the traditional blue and white Chinese porcelain called qing hua ci. "I made my first porcelain necklace simply because my skin was allergic to many necklaces sold on the market," says the 25-year-old designer, who majored in fashion design in her native Hangzhou in Zhejiang province. This later turned into a mission with the support of her parents who encouraged their daughter to establish her own career in Beijing. Influenced by her parents' love for antiques and porcelain, Huang went to great lengths to start collecting qing hua ci for her jewelry making. Although she now has a regular job at an art center in Beijing, Huang still spends much of her spare time and money on her search. "It is important for me to make a statement with my jewelry, which is - you can be trendy with a Chinese flavor," Huang says. "I have seen a lot of Western jewelry brands opening chain stores in China, so why not our own designers?" Hong Huang was also impressed by the artful simplicity she saw in the works of Wang Yiyang. Gathered under the Chagang, or Tea Mug brand, Wang's designs use elements from the much simpler era of the 1970s, such as a white enamel mug with a thin blue rim or tote bags with large characters such as "Shanghai" or "Beijing" printed on them. "This designer managed to bring the fashion sense of my childhood into the 21st century. I was deeply touched," Hong wrote in the Editor's Note of the 2010 March issue of her magazine, an edition dedicated to Chinese designers. "They are audacious enough to pursue their dreams, like me," she says, with empathy. Hong's early media ambitions were against her mother's wishes, which were to see her daughter become a diplomat. It is not the first time young Chinese designers have tried to establish a presence on the international stage, so why is Hong confident her store will launch the designers into international stardom? Because she is putting her money where her mouth is, she says. "A lot of people have advocated supporting local brands for years, but they still go to established designers such as Louis Vuitton, Christian Dior and Gucci. The fashion magazines also give much attention to these luxury brands, as do increasingly affluent readers who are now willing to spend big money on good design. "Local designers and brands have been sidelined and fighting an uphill battle against Western imports, which have long dominated the Chinese market. BNC is a platform for young designers who share our culture and are pioneers with their own ideas. "They are passionate and creative, but lack the funding and experience to build up businesses and brands. That's why I want to give them a hand and offer them a chance," says Hong. She hopes even more Chinese designers will find a platform with BNC and in the meantime, for budget-conscious white-collar workers, BNC promises to be the place where they can make more than a fashion statement.